An F-35A Lightning II aircraft from Hill Air Force Base, Utah, takes off from Nellis AFB, Nev., Feb. 2. 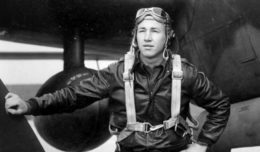 Airmen from the 388th and 419th Fighter Wings at Hill are participating in Red Flag 17-01. 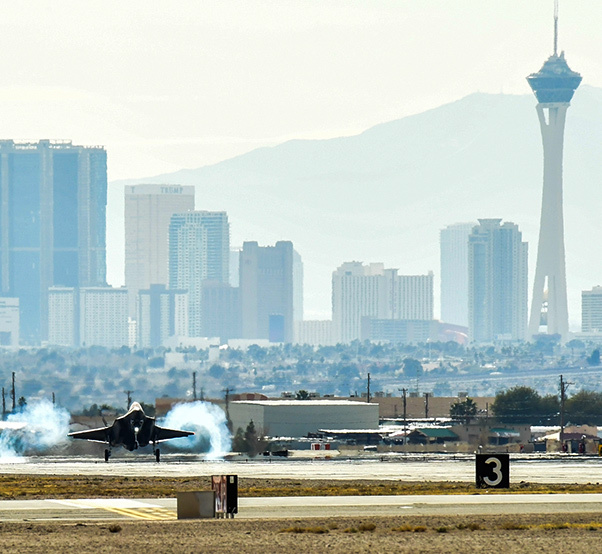 Red Flag is the U.S. Air Force’s premier air-to-air combat training exercise. This is the first F-35A deployment to Red Flag since the Air Force declared the jet combat ready in August 2016. 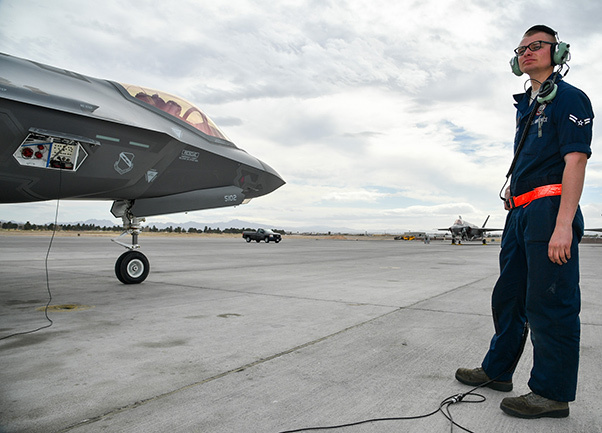 Airman 1st Class Nathan Kosters, a crew chief with the 34th Aircraft Maintenance Unit, prepares to launch an F-35A Lightning II aircraft during Red Flag 17-1 at Nellis Air Force Base, Nev., Feb. 7, 2017. F-35 Lightning II’s from Hill Air Force Base, Utah, fly in formation during a training flight May 2, 2017. F-35 pilots are using the airframe in its first-ever flying training deployment to Europe. F-35A Lightning II’s from the 34th Fighter Squadron at Hill Air Force Base, Utah, land at Royal Air Force Lakenheath, England, April 15, 2017. 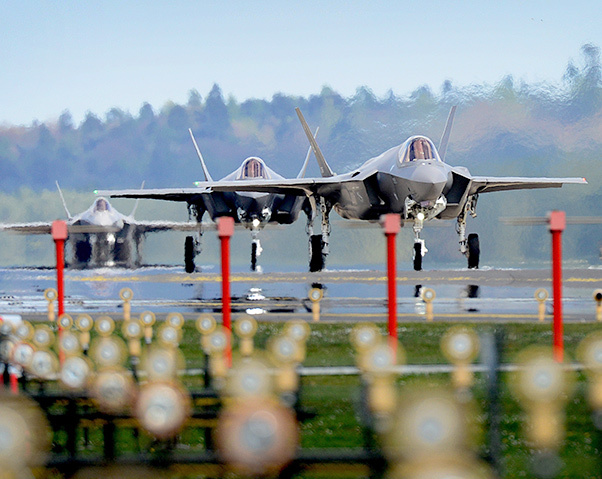 The aircraft arrival marks the first F-35A fighter training deployment to the U.S. European Command area of responsibility or any overseas location as a flying training deployment. 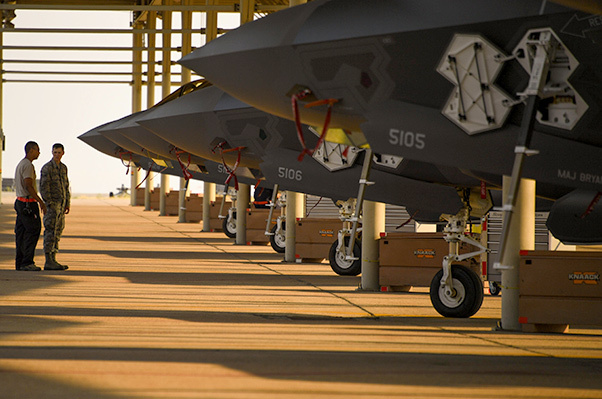 Airmen assigned to the 388th Aircraft Maintenance Squadron prepare F-35A Lightning II aircraft for flight at Hill Air Force Base, Aug. 7. The Airmen and aircraft participated in Combat Hammer, a multi-day air-to-ground weapons evaluation which takes place over the Utah Test and training Range. Staff Sgt. 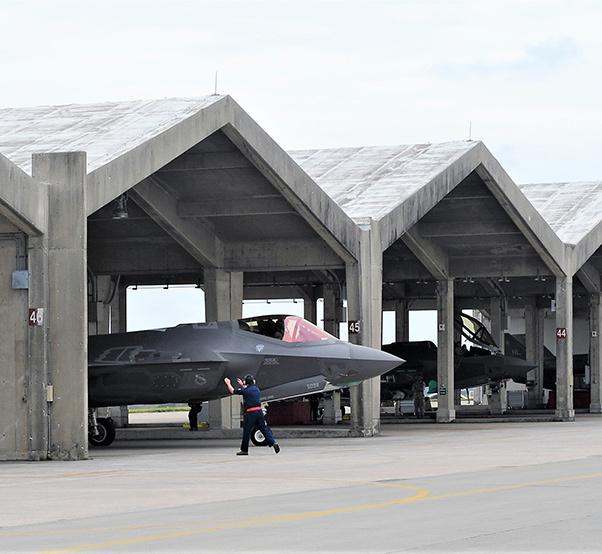 Jordan Jones with the 34th Aircraft Maintenance Unit directs an F-35A from the flows at Kadena Air Base while deployed in support of the first F-35A Pacific Theatre Security Package. This long-planned deployment is designed to demonstrate the continuing U.S. commitment to stability and security in the region.